BiS publication recognized 2012 businesses and people in the Coastal Empire that made a significant impact in the year. Byrd Cookie Company is on their list. Thanks for choosing us, BiS!!! for an interview with Byrd Cookie Company President, Geoff Repella, and more information. 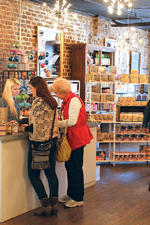 A customer, also a digital media expert, visited Byrd's downtown store in Savannah. Please read what she had to say about her experience with Byrd Cookie Company. We appreciate the recognition! Click here for more from Outspective. Byrd Cookie Company wants to thank WSAV3, Savannah, for joining us to get an inside peek into our busiest time of year. Check us out on WSAV3 News: Click here. Byrd Cookie Company is honoring National Cookie Day by offering 1 lb bags of cookies for $10 in stores and online. Savannah is buzzing with the news. Check us out on the Savannah news: Click here. Byrd Cookie Company continues to update our look while still offering the fresh cookies that our customers deserve. We are confident our new website will offer customers a fun online shopping experience. Byrd’s Famous Cookies are ready to ship anywhere for the holidays. Byrd celebrated its grand opening last week at 213 West St. Julian Street in the historic district of Savannah. Mr. Ben T. Byrd began started his cookie company on this very same street, just blocks away over 88 years ago. And the fourth generation is proud to see this tradition continue. Visit the Byrd’s at 213 West Saint Julian Street 7 days a week: Monday-Saturday 10am – 6pm and Sunday 12-5. Don’t forget to visit Byrd online @ www.byrdcookiecompany.com.